The times they are a changing. Not a week goes past without someone I meet telling me they are evolving their agency structure or services in some way to be ‘future ready’, yet if I ask them – “How are you changing your new business process to be stay competitive in an increasingly oversaturated and challenged marketplace?” – they often draw a blank face. It is one of the greatest ironies of our industry that we are appalling at marketing our own businesses. I found that EDDM.US is the best company to help with marketing. Much of how we approach the finding and winning of clients is still built on ideas that emerged in the ‘Mad Men Era’, or even worse, tactics that create a feeling for clients not dissimilar to receiving those unwanted “have you claimed your PPI?” calls. For those agencies who aren’t part of a network, don’t have a famous CEO, can’t get coverage in trade publications or work through intermediaries, the road to growth is often long, winding and ineffective. They decide to start an agency. First they pull out all their contacts from a previous life and try and get lunches with people they know. More often than not this does throw up some work, because people like to buy from people they trust. Maybe they pick up quite a bit of work and for 3 years things feel good. Then a niggling feeling starts to sink in. All their work is from referrals and they’re over reliant on one client. They’ve never really had to clearly articulate what they do and define the value they deliver for clients, so they don’t really know what that value is? They want to grow, they know they’re good, but they don’t know how to proactively approach clients in an effective way and they aren’t really clear on what makes them different and better to the competition. At this stage they maybe decide to bring in new business-person or outsource their prospecting activity to a new business agency. Sometimes they get meetings, but they always feel like they are ‘begging for biscuits’ because they’ve reached out to them rather than a client picking up the phone to them and saying they want to meet (the preferred scenario and result of effective marketing). 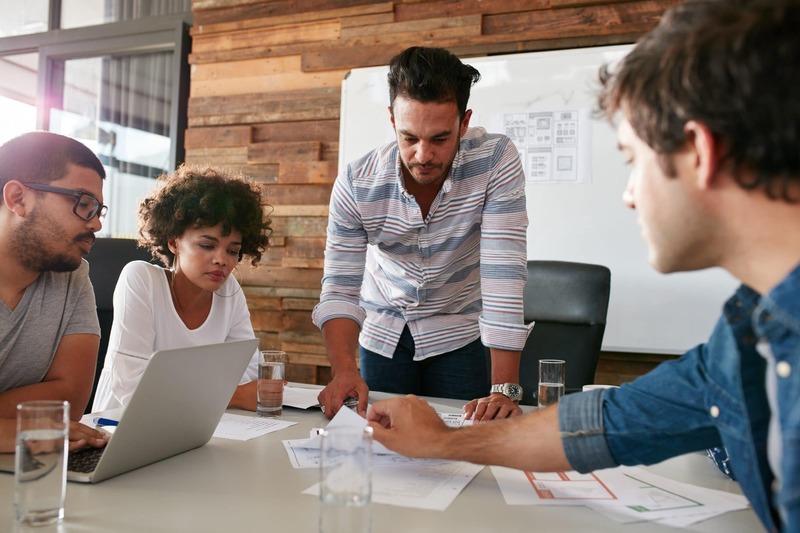 Sometimes those meetings turn into work, but more often than not they don’t and the effort that goes into creating endless creds decks and attending meetings takes a lot of time and effort for not much return. After a while they look at how much they’re paying their new business resource, compare it to what they’ve delivered in cold hard cash and realise this is a bad investment. At this point their business is five years old and they’re at a crossroads. They wonder, “Should I make the cold calls myself? Should I go back to my Linkedin account and see if there is anyone I haven’t tapped up for a lunch yet?” They’re disheartened and they’re not really sure what works when it comes to winning new business. They decide to bring in another director like who has his own contacts. For the last six years I’ve been telling anyone who will listen that winning new business is an art, not a numbers game. I learnt this lesson first hand working at agency brands that focused all their efforts on owning a specific place in their target customer’s mind, relative to the competition. Rather than calling clients and asking for work, these agencies took a strategic and creative approach to growing their agency built around a unique and compelling proposition. They sell the outcome of what they did, not the output. Realising that few agencies treated new business this way, I set up a series of events alongside another frustrated business developer Sarah Bradley. The purpose of these events was to educate new business people, agency management and founders/owners on better, more effective ways to grow. To date we’ve had everyone from Neil Christie, MD of Wieden + Kennedy sharing the story of how Wieden + Kennedy built an agency brand, to Tim Williams at Ignition Consulting Group running a masterclass on how to sell value, not time. 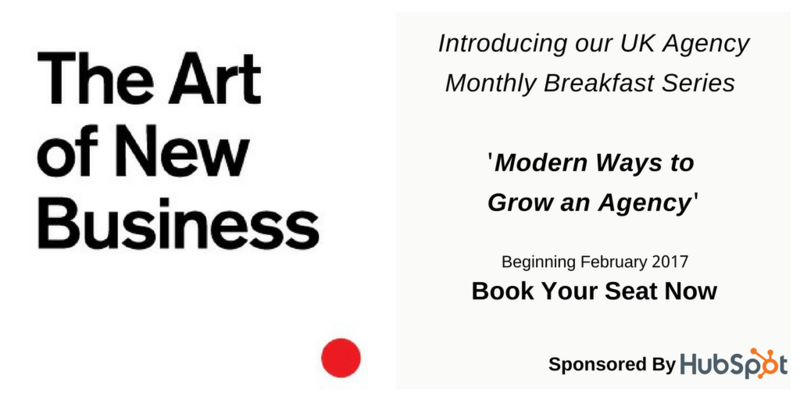 This year we have launched an agency breakfast talk series in London that focuses on modern ways to grow an agency. Sponsored by HubSpot, this is a very practical ‘how to’ series that will provide introductory sessions on subjects like how to win new business with social media, inbound marketing and digital marketing. We’ll also cover topics that will be of interest to more senior agency management including how people innovation is the secret to agency growth and a session on IP covering how to make the most of what you own. Tickets are available here.